The Southern California Gas Co. has tentatively reached a settlement with California and the city and county of Los Angeles to pay $119.5 million for the 2015 Aliso Canyon gas well blowout. In a joint press conference with Los Angeles city and county leaders, California Attorney General Xavier Becerra announced the settlement and how officials plan to spend the money. One key provision of the settlement is that SoCal Gas cannot pass on the costs to ratepayers. In addition, Becerra said SoCal Gas will reimburse the local, county and state governments' legal fees, meaning taxpayers will not foot the bill for all the litigation that went into the settlement. In late October 2015, one of 114 gas wells operated by SoCal Gas failed. It was the start of what ultmately became the largest-ever uncontrolled release of natural gas in U.S. history. In all, more than 100 metric tons of natural gas and other substances were released into the atmosphere. Also, the settlement resolves the county's lawsuit against the state Department of Conservation, Division of Oil, Gas and Geothermal Resources aka DOGGR. The county had sued the state over its approval for the Aliso Canyon storage field to return to limited operations last year. More than $45 million of the settlement will go cover the cost of projects that benefit the environment. 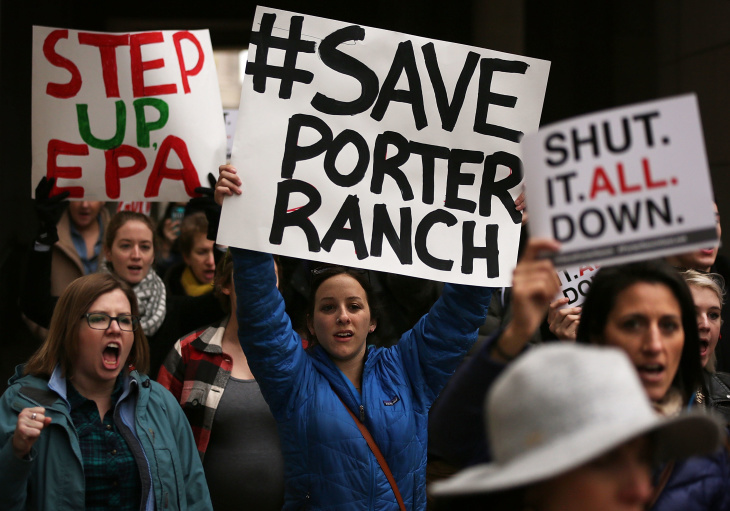 That includes $25 million earmarked for an extensive health study of Porter Ranch residents . Officials said the money also would cover the cost of additional air quality monitors near the site of the leak that will be operated by an independent organization. That's intended to address previous complaints by residents living nearby that air monitors installed by SoCal Gas — part of an earlier settlement of criminal charges — were sometimes offline. The company commits to spend $26.5 million projects to offset the environmental damage that the greenhouse gases from 109,000 metric tons of methane did and to set aside another $7.6 million in reserve in case more work remains to be done. Those projects will mostly be methane capture projects at Central California dairies. City Attorney Mike Feuer said Wednesday that the benefits will extend beyond the Porter Ranch community directly affected by the gas leak. He gave examples such as air filters in schools and electric school buses for communities that suffer the most pollution. It could also pay for lead paint testing, he said. The settlement includes $21 million dollars in civil penalties, to be split three ways between the city, county and state. That money is to be dedicated to consumer protection programs, said Scott Kuhn, acting assistant county counsel. Also, the settlement covers $19 million of the county's legal costs. State Sen. Henry Stern, who represents the area, also criticized the agreement. Stern said in a statement that he plans to introduce a bill that would prohibit settlement money from being spent outside the area directly affected by the methane pollution. Food & Water Watch, a group that has been calling for the gas storage field to be permanently closed, was also critical. 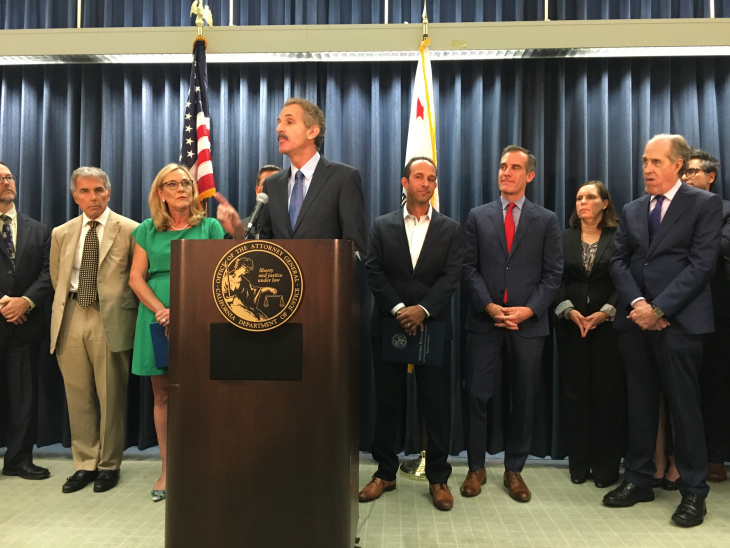 The settlement is "bankrolling SoCal Gas' efforts to keep California dependent on gas," said Alexandra Nagy. Her group said settlement money should not be used to import dairy-produced methane from Central California to refill the Aliso Canyon gas field. And she also called for the health study to be done by a neutral third party, and not by the county, which the group said "downplayed and misled the community about health issues" stemming from the gas release. WHAT ABOUT THE OTHER CLAIMS? Officials say this settles the government plaintiff's cases, but there is still a ton of litigation to go. Nearly 400 other lawsuits with some 48,000 plaintiffs still remain to be heard. Those cases have been combined into a single case under a Los Angeles County Superior Court judge. IS THIS IT FOR PENALTIES FOR SOCAL GAS RELATED TO THIS LEAK? No. The company still faces enforcement action from the California Public Utilities Commission. The agency is carrying out a study as to whether the underground storage field at Aliso Canyon that leaked can be minimized or closed entirely. The gas field has been the Los Angeles region's energy backstop for decades. It stores a large supply of natural gas that, during normal use, can be withdrawn when not enough is flowing in pipelines to power local gas-fired electrical plants or heat homes. But the gas field was temporarily barred from operating, but it has been allowed in the past year to operate at a lower volume, which lessens the pressure on the field's wells. State regulators permit gas to be withdrawn from the field only in energy emergencies. SO WHAT'S THIS COST THE COMPANY SO FAR? The announcement of the settlement came the same week that SoCal Gas officials reported the cost of the disaster — the largest-ever uncontrolled release of natural gas in U.S. history — had reached $1 billion. Half of that cost was spent on relocating 8,000 families and clean up, according the company. SoCal Gas has insurance to cover up to $1.4 billion in damages, it was not immediately clear if insurance would be used to cover the $119.5 million settlement. 2:13 p.m. This article updated througough with additional context and response. 11:51 a.m.: This article updated with the provision prohibiting the company passing on settlement costs to ratepayers. 11:14 a.m.: This story updated with information about the costs to date. This article was originally published at 10:22 a.m.